Special one-day sale! Order a copy of my book (and/or anything else from Lulu), use the codeword CYBER305 and receive 25% off your entire order! But, hurry; the sale is today only! 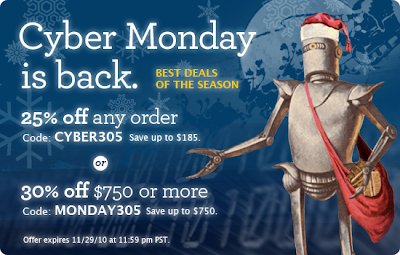 Just out of curiosity, does the "Cyber Monday" concept even make sense anymore? There can't be all that many people anymore who are eager to start their Christmas shopping ASAP after Thanksgiving, yet still postpone online shopping until they get back to work the following Monday. Can there?